Whit Week, religious festival, Manchester 1950s. On Fridays the Catholics walked, on Monday the C of E's did likewise. The walk was to Albert Square, from your home church, strong men bearing the heavy banners, representing their church, girls in Sunday best frocks, boys brigades bashing out a number. Besides the big walk to town, there was a parish walk on Sunday. The walkers set off from the street adjacent to St. Saviours church, strolling peacefully along, bible in hand with saintly thoughts, until, we got to an area close by where the opposition's kids were lying in wait, ready to pelt us with stale bread. Religious thoughts evaporated, Mr. Flood the vicar his surplus flapping, valiantly attempting to calm things down . Whit Walks still take place though they don't seem to be such a big event as they were in past times. They are an important element of local life and luckily, many photographs exist which document them, one of which can be seen below! It is the Whit Walks in about 1958 and it is a picture of St. Saviours' walk, setting off from outside the Sunday School school rooms which are to the left on the picture. I am on this picture, on the right, second from the front, my friend is directly oppostie, her name was Anne Worral of 2 Avon Street, I lived at No. 7. We were both wearing the same frock, it was a lemon colour. We were on the 'big banner', and it depicted The Lamb of God. The big banner was stored in the school rooms, unfortunately it was set alight one year and subsequently lost in the blaze. Plymouth Street, Chorlton on Medlock, Manchester 13, was the location of the photo. Ah yes, 1958, the year I was born. Very interesting picture. I will have to look up on the old map to find this location. I drive past this place every day, but it's mostly unrecognisable now! Well done 'mam'! It's nice to think the name was chosen by a 'real person' and not a marketing executive or focus group. The name of the Mancunian Way was chosen in this way too. EWM Photo: SUDELL ST AND ROCHDALE RD, FLAT IRON BUILDING. I HAVE JUST GONE THROUGH YOUR NEW UPDATES. AGAIN VERY INFORMATIVE AND TASTEFUL. IN RESPECT OF THE PIECE BY MR FOY, THIS IS THE OLD BALMORAL HOTEL, MY MAM WORKED THERE IN THE SIXTIES. I WAS TRYING FOR AGES TO TRY AND THINK OF THE NAME AND IT CAME TO ME IN A FLASH OF INPIRATION. ON ANOTHER SUBJECT. HAS ANYONE FROM TEMPLE SCHOOL BEEN IN TOUCH WITH YOU REGARDING "MY FENCE" THEY ARE TRYING TO HAVE IT CUT OUT AND SENT TO ME, THEY SAID THEY HAVE BEEN IN TOUCH WITH THE M.E.N. AS A SPECIAL INTEREST PIECE? I will be featuring the article, which appeared on the front page of the evening news, in the next update of Eyewitness in Manchester. Thanks for providing a fine view of the exterior of the housing at Victoria Square, an impressive example of a very progressive early approach to municipal housing. Those who want to see more of it might enjoy checking out the video of the recent movie, "There's Only One Jimmy Grimble", which has several sequences set in the interior courtyard of Victoria Square (the movie also has some great shots of Maine Road, and reminds us there are actually TWO football teams in Manchester, Manchester City and Manchester City Reserves). From or connections with: Prestwich/Sedgely Park,Kersal. Present Location: Littlehampton. West Sussex. Re the messsage from Susan Jaleel regarding the Manchester Hippodrome. Poor Frank Pearson must be getting confused. There were never two Manchester Hippodromes - imagine the confusion in the advertising. The original Hippodrome stood in Oxford Street, partly knocked down with the stage being incorporated into the Gaumont Theatre. Now the site houses a multi storey car park. When the Hippodrome was demolished in 1935 the name was taken by the Ardwick Green Empire. This possibly is the only Hippodrome that many of your readers knew, but it was the second to bear that name and the Hulme Hippodrome was always known as the Hulme Hippodrome. I hope this finally clears things up for Frank and others. Yes, this does clear things up, I think - Here's a recent photo of the roundabout at Ardwick Green with the Apollo on the right and the site of the later Manchester Hippodrome, formerly the Ardwick Green Empire on the left behind the advertisement hoardings. Hope your enjoying the bad weather at home. Im in Sunny America living it up.!!!!! Nice to hear you're having a good time, but actually, the weather has been really good here! As an expat of Manchester I truly love your website. Your photos bring back many happy memories of my life in Manchester. I have lived in Adelaide, South Australia for 31 years, only going back to Manchester in 1988 and 1999. There have been so many changes, in those 30 odd years, some for the better, some not. Thank you for the photo of the RED LION pub in Withington. My father worked a few doors away at Nelson's Upholsterers right next door to Christies Hospital, for 25 years. I think the shop has now been demolished. "Fire, sweeping through All Saints Parish Church at West Gorton, Manchester has rounded off a four year chapter of bad luck. The roof was seared by the blaze, windows shattered by the heat, plaster cracked from walls and the organ, organ chamber and lady chapel left as bare brickwork. The 84 year old church had already been hit by susidence, and the damage was growing steadily worse. The rector, The Rev.John Smith aged 36, said to-day, "Now this fire has finally ruined everything and we can't use it again". Several months ago the church council made plans for a new £22,000 church. At one point firemen fighting the blaze ordered heartbroken parishioners, desparately salvaging choir robes, vestments, and fittings in the dense smoke, out of the building in case the roof collapsed. The firemen had a difficult job. They found they could not climb on the roof because it was covered with ice; hydrant covers were frozen; water froze as soon as it hit the building, and hoses had to be dipped in warm water after use as they froze solid. The All Saints Church of England school, which adjoins the church, may be used for services next Sunday"
Obviously the fire must have occurred during the winter months of 1964. Prior to the fire the church was suffering from subsidence caused by underground coal workings. Manchester Public Library holds articles about the work need to restore the church. I read in one of your reader's messages, that St. Thomas Church, Ardwick, is still standing and in good condition. Any chance of a photo of this church? My husband, his parents and their ancestors were all married an baptised at St. Thomas Church. I could write a book of my memories of Manchester, but that would take all day, so once again Aidan, I say a big thank you for your website, and for giving all of us living in other countries so many lovely photos of our old city. Thank you very much for your contribution and for your favourable comments on my work. People here are largely unaware of what I'm doing, but I intend to change that very soon! A book of your memories? Sounds like a good idea to me! Didsbury and Withington have changed a bit since I lived there in the 1960's and I sometimes have difficulty knowing where exactly the photo was taken. Are you able to give some sort of a before/after comparison? I used to know Didsbury VERY well, but apart from the library, I don't seem to recognise anything anymore! I love the photos though. I DO remember the Red Lion in Withington. I used to live opposite the Golden (?) Lion pub - my mother had a baby linen shop there - on Wilmslow Road, Withington and later went to live further up the road, on the corner of Wilmslow Road and Fog Lane. I think that house is still there, although there appears to be a block of flats opposite, where once, a large house stood in its own grounds behind a high brick wall. Thanks for all the nostalgia - I love it! 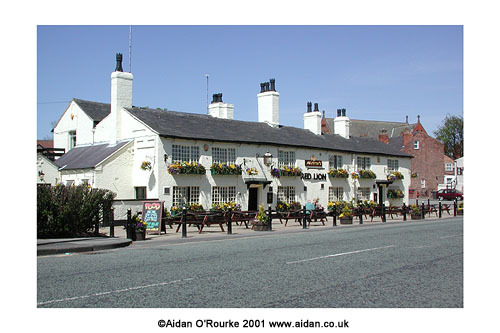 You've chosen the same EWM photo as the previous correspondent, the Red Lion Withington. As I've said before - your scenes of nostalgia are my day to day reality! The Withington and Didsbury areas largely retain their character. There's been some new development, but most of the houses and buildings look much the same as ever. There hasn't been transformation on the scale of Hulme, or the type of urban decay we see in Cheetham or Beswick, Openshaw and Bradford, now known anonymously as 'Eastlands'. A very short communication but I think we get the message! Let me know if you make any new expat Mancunian friends around the world. I recently wrote to you, However my website has changed. I also wanted to tell you & readers That my long lost Teacher Mrs Robinson of Bury (ex of Wellington St School Pendleton) Has sent to me here in Perth WAust a photocopy of the programme of the Farewell closure of THE school in 1974.Mrs Robinson became Lady Mayoress of Bury. I went to Salford Library in 1998 & tried to find anything related to Wellington St School.Nothing available, However,I did buy a video of Manchester life.I will be over again in 2002 Sept/Oct & would love to catch up with old friends. Email me if you remember me. Regards to one & all. Thanks for your message. Enjoy your upcoming visit! I used to work in 1964/66 at THE Y.M.C.A in the canteen, in the evening. I sometimes went to Manchester early from Sale Cheshire. I then went into Manchester Town Hall. I used to be amazed at the beautiful Stained Glass window of St George & the cobbled court yard. I was told Oliver Cromwell used to tether his horse in the stables within the yard of the Town Hall. On leaving the Y.M.C.A. the guys "clubbed together" & bought me a book on the 1000 year anniversary of Westminster Cathedral. I cherish it. I am still in contact with Norma who worked alongside me at the "Y". Norma now lives in Wales. Good that I have my computer, the world is a much smaller place, thanks to my email facilities. Yes, it certainly is. I presume Oliver Cromwell tethered his horses at a stable on the site of the future Town Hall, which was built in the 1870's. Oliver Cromwell's now stands outside the Hall in Wythenshawe Park, permanently laying siege to it, as he did during the Civil War in the 17th century. There are probably photos of these locations in the Local Studies Unit of the Central Library, but if anyone out there has any of their own photos of these or other locations, please contact. I lived in Withington from 1934 to 1946 when I came to the U.S. as a war bride. We lived opposite the big Cancer Hospital, I think it was Christie's. My sisters and I took the tram or Didsbury bus to Manchester to attend Manchester High School for Girls. they later went to the new school in Fallowfield. I went to Miss Wilkinsons secretarial college in Albert Square before joining the Wrens and serving three years in Scotland. That's where I met my American husband. I well remember the Red Lion, the White Lion and wasnt there a Golden Lion, the Scala movie theatre, and Palatine Road. My parents played golf at the Withington golf club and my younger sister and I were allowed to have junior memberships. Any of your readers went to MHSG or remember Withington and/or Didsbury? We previously lived in Sutton Coldfield and Cardiff and when we moved up north, when I was 12, other girls laughed at our accent!! Keep up the good work. I was in M/C last year and visited the Lowry exhibition, very impressed, had never heard of him before. Hope I can get back again but am battling cancer at the moment. Thanks for your contribution. The Scala, later known as Cine City recently closed. Withington has the Red and White Lion, but I don't know of a Golden one! Wishing your a speedy recovery! I think it's a pity so many mill chimneys have disappeared from the Stockport skyline. Sykes bleach works chimney in Edgeley was a major landmark in my childhood but it disappeared in the 1980's I think. Thanks for your comments! I'm not usually able to photograph specific addresses, unless they're of general interest. Maybe someone out there can help. I have a couple of pictures taken close to Ladybarn Lane, I will be featuring them shortly. ..it's a grrreat! I reckon they could do with some of your pictures though. Got one of Highland House? Highland House? I'll take one soon. As you know I have just joined your mailing list. Thank you for such a professional and sympathetic historical and informative site. The quality of the photographs is excellent. I have especially enjoyed the pictures of Stockport as I remember so much the changes which have occurred there over the 8 years that I was at Stockport Tech. College doing day release from ICI(~1971 to 1979). Then there was the power station, and massive industrial sites all around the area. However the jet planes were louder then as they screamed just over the top of the college building....everything paused while they passed over due to a lack of double glazing. During that time I recall the town hall having its 1st clean-up and the demolition of the primary school next to the college and the War Memorial to build the college extension. Studying biology and microbiology at the college we had the annual choice of a visit to one of the 3 suitable sites in Stockport..namely: The sewage works, or the 'enzyme' works near Bredbury, or Robbies Brewery. Needless to say which trip we managed to repeat over & over again!! Thank you very much for your comments. I miss the loud planes - today's whispering jets just aren't as exciting! Yes, Stockport has seen many changes. One of my most vivid memories of my primary school, Our Lady's Edgeley/Shaw Heath - not far from Stockport College - is a visit to the power station with our teacher Sister Esther. The site is now Portwood Trading Estate with Dixons, Scottish Power, Toys R Us and the usual retail stores. I always found field trips much more interesting than staying in the classroom. Thanks for your contribution - I'm very interested in the relationships and similarities between the US and the UK. Hope to feature more photographs from that area soon. Would any of your readers remember a very well known company by the name of C.J.Townsend? C.J.Townsend was a steel erection company that did work all over the Manchester, Salford and surrounding areas. Their yard and office was located at 5 Athole St.Salford. I started work for them in March 1954. My first jobsite was Chadderton power station, I worked for them until 1957, whilste employed by them, I worked on such projects as Agecroft power station, Deansgate Arcade , Snelgroves, Irwell rubber, Lewis's and many more . Interesting piece of industrial heritage there - CJ Townsend I'm not personally familiar with but I'm sure there are many people out there who will be. Present Location: Bandar Seri Begawan, Brunei. Hello, great site - how do you find the time? I was a nipper in Stretford when THEY demolished King Street to make way for the Arndale Precinct (the first one?). I don't s'pose you'd have any photo's pre-eyesore??!!! This would be around the mid sixties if my failing memory serves. Thanks if you can, never mind if you can't. It's my job! I get paid for it so don't you worry, I will continue to capture scenes of contemporary Manchester. At the moment I don't have access to old photos, but there are many interesting local interest books available. Try doing a search in one of the online bookstores. Just wondering if anyone would know anything about White Cottage at 88 Bolton Road in the mid-1800s. Home to my great-grandmother, Margaret Hilditch, and her parents, George and Elizabeth, and seven siblings. Is it still there? Does anyone remember anything about it? Also interested in anything relating to several residences and a beer house at Holly Bank, same time period. I don't but I'm sure someone out there does! Hope you find success in your quest for information. Well I suppose you heard about Temple schools demise, well Aiden I managed to salvage MY railing, maybe you heard about it in the MEN.and on Radio 5 morning show,Breakfast Show. Now I have to arrange to have them shipped over here, any ideas? I would like to thank the Headteacher Mz Morton, Tony Phillips, teacher who did all the leg work and Colin Veitch of Allen Build-Turner for their contributions, thanks a lot. And you know Aiden you started this all of by sending me the picture of the railing. I will be featuring the article shortly! I read in one of your Salford Quays-related articles that you were in favour of skyscraper developments in the Quays. However, do you not think that skyscrapers would not be better suited to the city centre to give Manchester a "proper" big city feel? Developments like the soon-to-be constructed GN Tower are (in my opinion) certainly welcome in the city centre, but I personally feel that Manchester should be a little more ambitious in its plans for tall buildings. I read in www.skyscrapernews.co.uk of a proposal for a 46-storey tower at the MEN Arena (any ideas what happened to this proposal?) and surely such a development, if carefully designed, would be an outstanding landmark and an asset to the city? Anyway, I think your site is fantastic, and I visit it regularly -- keep up the good work. Tall buildings can add a new element to the city, and I like the futuristic feel of these buildings when grouped together. However, the problem I have is that they are at odds with the existing character of Manchester which is largely a creation of the Victorian era with a few 1930's additions. Of the buildings in the visualisation of the 'Slot Site' upper right, most, including our viewpoint Sunlight House (1932) are from this era. How do you incorporate a new high rise city within an older context? I think the only solution is to group the new buildings in one area, as they've done in Paris and are doing in Berlin. But in Manchester, the newer buildings are spread out and not really high enough, so there is no American style skyline. Thanks very much indeed for your comments, I really appreciate them. place, open until 2.00am and a great time,everyone from Henrys Horts and went there. Piccadilly side of Manchester. I don't remember the Mayfair Club, but I remember the Millionaire Club - Just behind Lewis's - I think it might have been in the same venue. Now Peter Stringfellow wants to return with another exclusive club featuring his brand of glamour, but there is controversy! Thanks for your message. With all these supposed improvements to Piccadilly Gardens can you tell me what will happen to the LSG (Local Seat of Goverment) situated underneath both the Gardens and the Piccadilly Plaza? I well remember my old CND days in the 60s when we used to demonstrate outside the building site entrance on Parker St.We even managed to break into the place before being arrested by plain clothes officers. LSGs for anyone unfamiliar with the term were intended as nuclear fallout shelters for the selected few with the view to carry on local goverment duties under martial law conditions.The two main entrances were the substation between the then new ladies and gents and also down under the main Plaza building.These sites scattered all over the UK were supposed to be top secret but the locations of some of the sites leaked out (there is another one under Dover Castle). I dont think for one minute that they would survive a modern nuclear attack but it could be turned into a tourist attraction and earn the city some much needed revenue. These underground structures are also known as RSGs ie Regional Seats of Goverment. Manchester is littered with tunnels,most of them now disused and forgotten Some that come to mind are the old Bradford Colliery on the corner of Ashton New Road and what used to be Mill St, the colliery is long gone but the extensive workings are still there underground. Another one this time a large second world war bomb shelter is underneath the now fashionable area that leads to the so called Piccadilly Village on the Ashton canal.The entrance to this maze of tunnels was behind Houldsworth Mill mid way along Ducie St.Many has been the time that as kids we used to explore these tunnels turning back only when the daylight failed to penetrate any further. Yet another bomb shelter was on Store St next to the stone steps this one was also a very large collection of rooms and connecting tunnels and when we explored it in the 50s still had bunk beds, ARP helmets and gas masks of every type nearby used to be circular concrete walls about 4ft high that I believe were the foundations for anti aircraft guns. Underneath what is now Piccadilly Station car park on Ducie St is a huge collection of brick tunnels all interconecting with each other that run from Jutland St (Stony Brew we called it) to London Rd and from Ducie St to Fairfield St with Store St bisecting them to form two sets of tunnels. I could not guess the acreage they cover and the amount of bricks used is mind boggling. As you all go about your daily business and like me decry the state of a once proud city just remember that beneath your feet are parts of the old Manchester that the developers will never touch. An amazing contribution - I'd heard there were tunnels under Manchester, but I wasn't aware they weren't so extensive. A few years ago, I believe the Manchester Civic Society held or were planning to hold a visit to underground Manchester, especially the part under Piccadilly, but I'm not sure if they were allowed access. In Stockport they've turned tunnels used as wartime air raid shelters into a tourist attraction and Churchill's Cabinet War Rooms in London are a major tourist attraction. Manchester's tunnels are all closed off and aren't spoken about. I have a gut feeling that there is a reluctance among 'the powers that be' to give full access to underground Manchester as a) the subterranean RSG's now seem rather preposterous, like something out of a 1950's science fiction film and it makes them look a little ridiculous and/or b) they might still want to keep them in reserve just in case they're needed in the future.